Friends of Balboa Park and the City of San Diego Parks & Recreation Department recently partnered together to embark on an ambitious project — reconstructing the 1935 Honeymoon Bridge. This landmark previously spanned Palm Canyon, connecting Alcazar Garden and the International Cottages in Balboa Park. 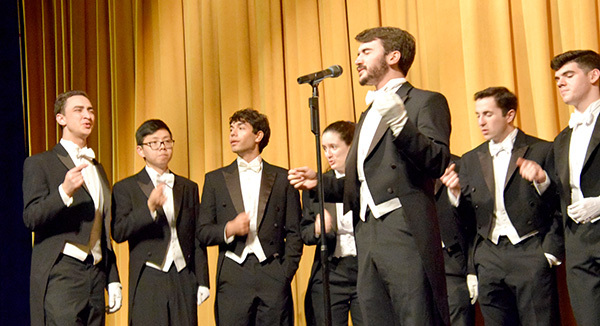 At a fundraiser event at the Ballroom in Balboa Park on Jan. 13, supporters of this project gathered for an evening of entertainment from the world-famous Yale Whiffenpoofs, America’s oldest collegiate a capella singing ensemble. 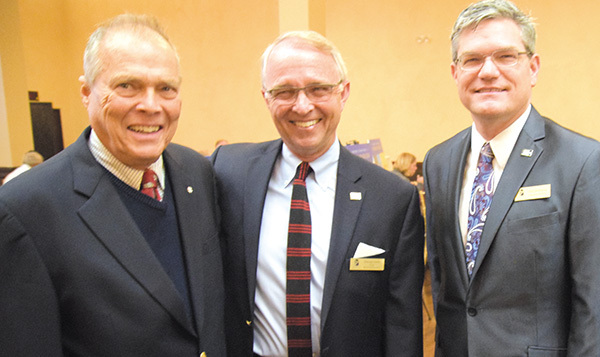 This event kicked off fundraising efforts for Phase 2 of this three-stage reconstruction project. 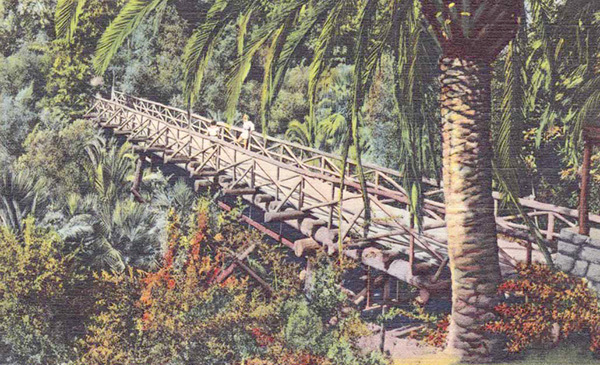 The bridge, which stretched over Palm Canyon, was built in 1935 and demolished in the 1950s. With an array of variable elements designed by renowned California architect Richard Requa, the 150-foot trestle bridge featured mission-style bell lights, wood plank walkways and railings made from eucalyptus trees. The complete recreation of this historic romantic bridge is slated for completion in late 2020 or early 2021. George Hardy, Friends of Balboa Park board chair, confirmed Phase 1 is complete. 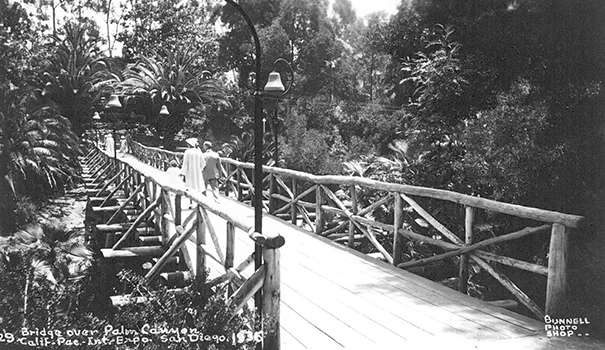 John Bolthouse, Friends of Balboa Park executive director, said that reconstructing the bridge will bring back a charming piece of Balboa Park’s history. Sitting 50 to 60 feet above the Palm Canyon floor, he said the original design — featuring mission bell light fixtures with drilled holes filled with jade colored glass — enhanced the bridge’s romantic attraction. If fundraising goes well, plans include extending the lights within the Alcazar Garden and also reconstruction of the original pathways leading to the bridge. 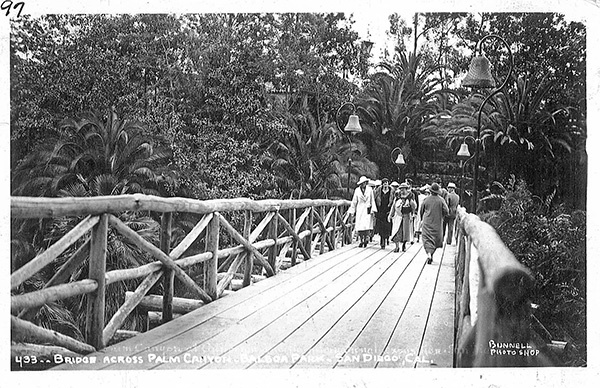 Kim Duclo, who has served as a Park Ranger for Balboa Park for 24 years, said that the original two acres of Palm Canyon began with Mexican fan palms dating back to the early 1900s. Now, there are more than a 1,000 species of palms that have sprouted throughout the canyon naturally, which will provide a lush view for visitors to the new bridge. As part of the reconstruction, San Diego Parks & Recreation will renovate the canyon including the variety of palms. Duclo said that the reconstruction of the bridge almost happened 17 years ago when the Timber Framers Guild held its annual conference in San Diego. Duclo said that he has been archiving to try to put bits and pieces of the park’s history. Currently, his collection includes approximately 65,000 items. To complete this project, he worked with others to find old photographs, postcards and drawings mainly from the second exposition in the 1935-36 eras. One of his quests in researching was to find out how Requa’s famous Rustic Bridge became commonly known as the Honeymoon Bridge. Hardy said he thought the name generically evolved because of the bridge’s romantic ambience. Bolthouse added that no one really knows how or when the name change occurred. However, there is one story that he is willing to accept pertaining to eternal love. With Phase 1 of the project complete, Bolthouse noted Phase 2 is all about capital campaign fundraising, development of the Palm Canyon Comprehensive Site Improvement Plan, public workshops, community outreach and public comment. Bolthouse said the estimated cost of the entire project is around $450,000. To date, the Friends of Balboa Park have secured approximately $37,000, and the first $24,000 went towards the due diligence phase. However, the next step is to develop architectural plans and secure more definitive cost estimates, which will require additional funds, estimated between $70,000 and $80,000. The group encourages the San Diego community to get involved in the reconstruction process and help funding the project. For more information about the Friends of Balboa Park’s recreation of the Honeymoon Bridge project and how to donate, visit bit.ly/2CM4Prq.